"It's OK to Miss the Bed the First Time"
I've now been a theatre critic for about seven years now, and I've reached the point where I don't have to give anybody my name in most of the theatres. It's kind of nice. Last night I reviewed an excellent production of Les Miserables, which opened the summer season for Sacramento's Music Circus. I presented myself to the will-call window, the guy recognized me and we chatted about the start of the season. 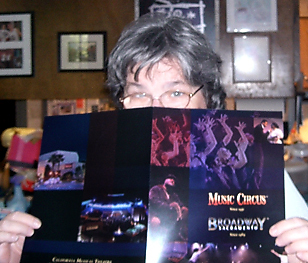 He handed me my reviewer's packet, a folder with pockets which contain pertinent information about the production, publicity photos, and brochures about upcoming shows. As Walt and I stood in a long line to get into the theatre, I was holding the packet like I used to hold my school books. The top of it was right under my nose and the familiar smell of slick paper wafted up. I buried my nose in the folder and took a big sniff. I love the smell of some papers. I always have. Especially slick paper. You can always tell which one I am in a crowded theatre--I'm the one with my nose stuck in my program. Literally! It got me to thinking about what other smells I love, some of which probably date back to my childhood. I love the smell of Jergens hand lotion. There are lots of lotions which have really pretty smells, but Jergens' almond smell reminds me of my grandmother's bathroom. Like my friend Diane, I love the smell of the Vicks Vaporub my mother used to slather on me when I had a cold. Intellectually, I know it doesn't really do anything but I'll take the placebo effect any day. Salt water and seaweed reminds me of the house my aunt and uncle had, for a brief time, on Strawberry Point, where the front yard was literally in San Francisco Bay. (The house was later declared an historical house, moved inland and, last I knew, housed offices for the Audubon Society.) The ocean and the smell of the ocean has always been something that restores my spirit. I lived near Fisherman's Wharf, growing up, close enough that my father and I could walk down Leavenworth Street to the Bay and watch the fishermen heading out on their boats. We would buy walk away crab cocktails which we would eat while leaning on the fence over the crab boats. When I can get past the crush of tourists on Fisherman's Wharf today, the crab pots still remind me of a simpler, sometimes happier time. Thinking back to yesterday's entry I still love the blended smell of incense and candles inside a warm church. I wonder if there are still banks of votive candles in newer churches these days. I haven't paid for a votive candle since 1969, when we went to the ordination of our friend Ed Andrews (for whom Ned was named). I stopped in the chapel to light a candle and Ed (now "Father Alexander") laughed to Walt that women always do that. I love smells that aren't good for me. Gasoline for example. I love the smell of gas as I'm pumping it. I love the smell of alcohol and would occasionally put some on a ball of cotton and keep it in my desk when I was working for Dr. G. I also love the smell of white-out (fortunately I no longer need it! ), and the smell of the acetone that was used to print those old purple ditto sheets. I used to love to sniff a stack of pages that had just been run through the ditto machine. My newest favorite smell is "puppy breath." I don't know at what age they lose puppy breath. It's some time after they start solid food, but not before they leave here. Even puppies who have been eating solid food for a couple of weeks still have puppy breath when they leave here, and rarely still have it by the time I see them again at Petco when they go up for adoption. Looks like I'm back in the puppy breath business again.